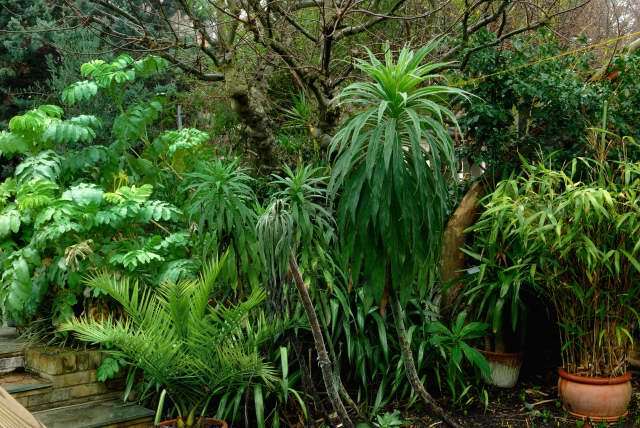 In the cool climate tropical garden the plants generally used for winter interest will be evergreen plants. This means you could also classify them as plants with year round interest. When you begin to design a tropical garden, think about which parts of the garden need year round/winter interest. View the garden from the house. For a significant part of the year the garden is to be looked at rather that sat in. Corners always look better with tall things growing in them. Sheds or any other ugly structures can be hidden. Seating areas benefit from being surrounded by permanent plantings. Occasionally during winter there are fine days to sit out in. It is generally more pleasant to enjoy your tea/coffee/booze on a crisp winters' day surrounded by plants rather than mud. Also to consider are any over-looking windows you need to blot out. Areas close to the house also benefit from winter interest. Again it is more interesting if the views directly in front of your windows are planted. The house also throws out quite a lot of heat, this allows you to grow more tender exotics. These plants can then be viewed close up, from the comfort of your nice warm house. Arrange your winter candidates in groups, this looks nicer than several intermittent plants. Some of the plants you may chose to use for winter interest may eventually get taken out by the frost. Keep one or two tougher plants in each cluster of cold hardy exotic plants, then, when the weak fail, there is always backup from these tougher plants. Although the interest in a particular area may have diminished there is still something to look at. The tree fern is Dicksonia Antarctica. This plant generally remains green through most zone 9 winters, temperatures below about -4ºC will begin to turn the fronds brown. The plant will remain greener for longer when planted in the ground. 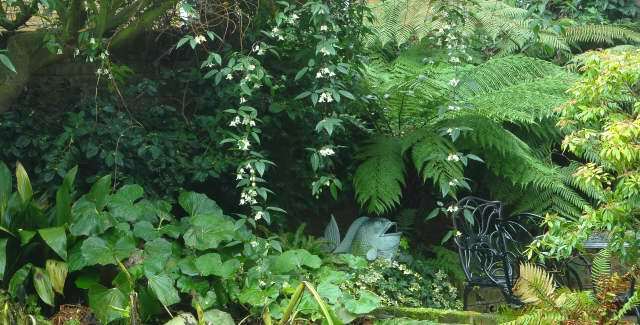 The rest of the general evergreen scene is made up of a mixture of Camellia, Aspidistra, Ivy, along with native ferns and a few other things. In many ways the transition of the garden, from bursting at the seams in summer, to the relative emptiness of the garden in winter is pleasurable in itself. This gives you time to take stock of the garden. Time to think about the garden. Cutting back all frost damaged foliage. Digging up and storage of tubers and rhizomes (where necessary). Pruning tall grasses, trees and shrubs. Moving plants to more suitable locations. Tropical rhizomes and tubers are brought into growth. Dahlia cuttings need to be started. One of the most important things to do in the garden during winter, is to imagine or visualise as it is now known, your next planting scheme. Based on the plants you are planning to grow this year, imagine them growing in the border. This is a lot easier when the borders have been cleared of last years debris. See the plants growing in your mind. This process becomes easier each year as you will learn the different plants characters and what you can expect from them in a typical year. Then by the time you come to planting, you will have a pretty good idea of where to put everything. There is a very good chance that there are parts of the garden that did not quite work last summer. Spend time in your garden studying problems area. Perhaps you bought a plant on impulse and never got round to planting it. As time passes you will be sitting in the garden, then& one day, you will have a little eureka moment. You will find the perfect planting spot for that neglected plant. You will come up with the solution to that awkward area. ;The more time you spend in your garden getting to know it, the more answers it offers up. Tree ferns - Dicksonia Antarctica. Clearly this list is not exhaustive but there are a few in there to be going on with. 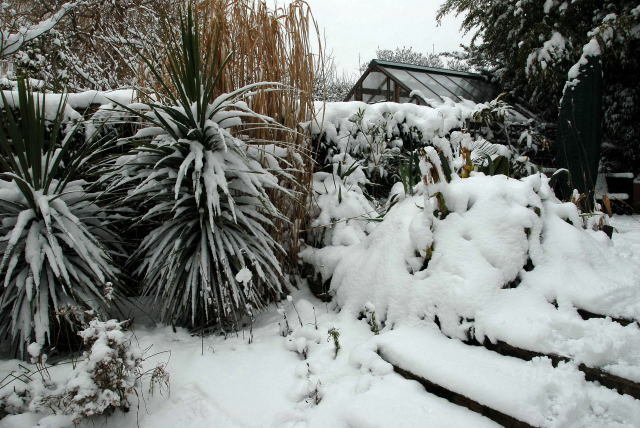 Plants such as Echium pininana will most likely die in temperatures below -4ºC. Melianthus major will be cut to the ground at similar temperatures. 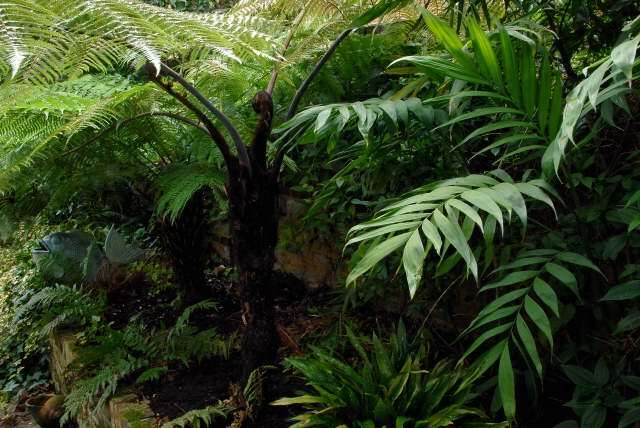 Tree ferns and Cycas will likely also get their fronds singed below -4ºC. You probably don't want to get too hung up on the winter interest concept. It is nice to have some evergreen plants in the garden giving year round interest but the real fun comes with the fast growing tender tropical plants. No doubt you have sat through countless garden makeover programmes on the TV where we are shown in great detail how to mix cement and how to nail two planks of wood together. The last five minutes of the programme are then dedicated to the planting. What all the presenters generally say at this stage is something like "And now for the best bit - planting the garden". With cool climate tropical gardening you have that 'best bit' every year. You can plan, plant and grow a different planting scheme every year and blow raspberries to anyone who tries to tell you this is not real gardening.